Mr. Miyamoto, you recently asked me to ask Kotaku's readers to say which games they'd like you to make for the Wii U. Your question was extremely popular and I got a lot of replies—more than 3,000. And a lot of them involved a particular word: Metroid. There were calls for a new Metroid game—specifically Metroid Prime 4—but there were also a lot of calls for a Wii U Pokémon Snap. There were requests for new Wario games, new Luigi games and a game starring Princess Zelda. There were requests for platformers, role-playing games and even a business simulation based on the founding of the company you work for. A lot of people asked for sequels, which is something you and I have talked about. You know how it goes: people want you to do something new but they also want you to revive old favorites. Well, good news! Quite a few people are ready for you to do brand-new things. They even shared some ideas. A new 3D Mario game (Galaxy 3 or Sunshine 2). An original Dungeons-and-Dragons-style game with the GamePad player serving the role as dungeon master. I'm going to break everything down for you below. Please note that I asked Kotaku readers to nominate games and I asked them to vote. The response was so overwhelming that things got a little messy, with multiple nominations for the same game. I've tidied it all up, but it's required me to ballpark some of the votes—giving you a minimum number so you at least have that to work with. Let's start this tally by pointing something out. People think that you have a lot of power. I mean, you obviously do, having created Mario and Zelda and currently overseeing Nintendo's EAD development teams in Kyoto and Tokyo. Still, you might be amused that a call for you to bring back Capcom's cancelled Mega Man Legends 3 earned 617 votes. Buy Capcom. Do it now. They are open for attack. Imagine if Nintendo owned all of Capcom's premiere franchises? Or made them a second party company? What a boon that would be for them. Nintendo and Resident Evil have a solid history. As well as Mega Man. Create new classic Mega Man games, and resurrect theLegends series! You know people want it! Monster Hunter as a continued exclusive would be great for them. They could resurrect classics like Breath of Fire. The only issue I could see is Street Fighter. But owning an industry-standard fighting series would be a solid exclusive. Could be a reputation-changer too. Yes, yes, you weren't asking people to suggest companies for Nintendo to buy. You were asking for suggestions about which Wii U games Nintendo should make. So it probably also doesn't really count for 651 people to have voted for a 3DS remake of The Legend of Zelda: Majora's Mask. 504 votes for a reader's suggestion that you should make Super Mario Galaxy 3 or Super Mario Sunshine 2. 72+ votes for a new StarTropics. 15 for a Wii U port of Kid Icarus Uprising; 15 for a brand new Wii U Kid Icarus. A call for a new Earthbound earned 396 votes; Gotcha Force got 111; Kirby's Dream Course 2 collected 47; a new Fortune Street fetched 28. Here's a big one: At least 597 people want a new F-Zero for Wii U. Would you have expected a call for a new Battle Clash? It earned more than 20 votes. A reader of exceptional taste called for a new Blast Corps (63 votes). But I'm not so sure Nintendo has the rights to that. You could manipulate objects in the environment by touching them on the GamePad! You can communicate with NPCs through voice and gesture recognition - the Game-Pads camera will lip read and help recognize your commands better than conventional voice recognition. 54 votes for "Osu! Tatakae! Ouendan 3. Or a new co-op-focused Trauma Center." Many, many people asked for Pokémon Snap. One nomination earned 39 votes, another 60 votes, another 223, another 356! "An open world PKMN Snap, with different unlockable cameras, camouflage gear to set up for special encounters, lures/bait, weather, a day/night cycle, Pokemon trainers showing up every so often letting you snap their battles (wild fights too), wind considerations (stay downwind of skittish PKMN etc). Maybe a tracking mode you can use the gamepad with; following footprints etc." A call for a Pokémon MMO garnered 41 votes. A call for a Pokémon action RPG got 4. 13 votes for a Wii U port of The Legend of Zelda: Four Sword Adventures. 5 votes for a Wii U port of Pac-Man Vs.
26+ votes for a new Wario Land. 70+ votes for a new Wave Race, 26+ for a new Custom Robo, 33+ for a new Fatal Frame, 23+ for a new Battalion Wars, 6+ for a new Golden Sun, 6 for a new Mario Paint, 3 for a new Chibi Robo. I'd like to see a Wii U Ice Climber game, that has much better physics and you navigating Popo and Nana independently using the two different sides of the Wii U GamePad (if you program the d-pad to act like A/B/X/Y for one Ice Climber, the GamePad would be symmetrical). Then have it so you get a game over if even one of them dies. Then maybe have the Wii U GamePad show an overview of a mountain (As you'll be climbing larger mountains now) that could warn you of incoming hazards such as blizzards while most of the action is on the TV? It could actually be quite a challenging platformer and Ice Climbers need a new game Nintendo. Plz. It's their 30th anniversary next year Nintendo - come on, give them another chance; even as an eShop game. A new Paper Mario? 74 votes, but not just any new Paper Mario. The game should be "Like the first two (but preferably on a larger scale, possibly making the stat building a little more elaborate, possibly allowing multiple partners at a time even), not like Super Paper Mario (because an RPG is best when it's primarily an RPG and not a platform game) or Sticker Star (because I like a decent story)." Other nominating posts for Paper Mario earned 86 and 77 votes, respectively. As for Paper Luigi? 33+ votes! 12 votes for partnering with Precursor Games and Denis Dyack to release Precursor's Shadow of the Eternals. As you recall from back in the GameCube era, Dyack had previously collaborated with Nintendo on the much-loved Eternal Darkness. Smash Brothers was a crossover fighting game. What about a crossover role-playing game? I was thinking kind of like Mario RPG + Zelda RPG + Metroid RPG, where different quests involve using traits unique to that character, and the last bosses are Mother Brain and Ganon teamed up. And you could have worlds where it looks like 8-bit and 16-bit and then 3-D, and have this completed and crazy world jumping experience with story elements from all the games. 7 votes for "A Zelda game where you play as Zelda." 11 votes for Baten Kaitos 3. 4+ votes for the return of Famicom Detective Club. 30 votes for putting N64 games on the Wii U Virtual Console. No, that's not a specific game, but you get the idea. I should mention that a few dozen people sent me e-mails asking for an Animal Crossing for Wii U. I have a sneaking feeling you guys are already planning that. Nevertheless, the king vote-getter... the mother of all vote-getters... the winner? Metroid. There were 706 votes for this: "Pull Retro off of whatever nonsense they are making and put them to work on Metroid Prime 4 IMMEDIATELY". There were 171 votes for yet another Metroid Prime 4 nomination. Please also consider also one reader's request for a 2D or 3D Metroid. That earned 869 votes! A massive online Metroid game, that uses the Wii U controller as a constant monitoring device of your home world and interaction... home world you say? Yes! You see, this online world is a Metroid title based around the multiverse theory, infinite universes with alternate realities! Each player being their version of Samus Aran; the bounty hunter, the medic, the colonel, the politician, the scientist, the explorer... and the true Samus who you need to track down, as her timeline originally housed the volatile metroids... originally. They spread. How does the absence of a Samus affect a universe? What is the impact of two in the same universe at a single time!? Look, remember when I asked you about Metroid recently? It wasn't just me making that up or calling in a favor. People really, really want to play a new Samus adventure. It's a good thing that you and Mr. Takahashi gave such an encouraging answer about the series. By the way, here's a nice picture of both of you that I took after our interview. You guys seemed to be having so much fun! Here's a plot twist for you guys: Believe it or not, a lot of people want you to not make sequels! 211 votes for "A Real Time Strategy game, similar to Starcraft and Command and Conquer, utilizing the strength of the Wii U touch screen controller. Emphasis on strategy puzzle solving, rather than macro mechanics." 111 votes for "Keeping the Xenoblade train going is a nice step but Nintendo needs to start another RPG franchise." 148+ votes for a "mature" game (horror, sci-fi, etc) along the lines of GameCube favorite Eternal Darkness. I'd like to see a Nintendo point and click adventure game. The Wii had some REALLY nice adventure games from TellTale come out for it (Strong Bad's Game for Cool People for example), and the WiiMote was excellent for point and click. Now, throw in the GamePad for inventory management (click on object in inventory to select and use, click and drag and object over another object to combine the two) and give Nintendo's quirky sense of humor and maybe have them partner with some other folks like, say, Double Fine, and we could have a pretty cool title here. 15+ votes for a Nintendo take on the world-creating/mining Minecraft and Terraria concept. Now I'm sure people will say that there are too many out already, and that's probably true, but Nintendo has a knack of taking existing genres and turning it into something fresh (Pikmin for RTS, Smash for fighting, Splatoon for team shooters, etc.). I think a Pokemon based MOBA with unique features like docking multiple characters would be a boon to the Wii U and be a great showcase for the gamepad. I'm imagining the whole map on your TV and the close up camera on the gamepad's screen; move the camera around with the left stick, click with the stylus, and L/ZL/left stick clicks can be skills/ults. 10 votes for an original 3D fighting game, maybe a Power Stone revival? A racing game. You have a leader who's on the Gamepad and racers who are on Pro Controllers/WiiMotes/etc. The leader is ahead of everyone else. As the leader moves, the track gets created. If the leader turns left, the track turns left. If the leader tilts the Gamepad up, a track going up is formed. The leader can tilt the Gamepad down to send his kart into the ground, creating a tunnel. The leader can place obstacles on the path for the players to move around (or utilize). There would be different modes. In one mode, the track ends after a certain amount of time or when the leader decides to place the goal; it is the racers' jobs to race to the finish. In another mode, the racers would try to beat each other to catch up to the leader: the leader wins if no one reaches him in a certain amount of time, but the racer that does reach him wins. You could even save the track and share it online if you really wanted and then just have normal races on the saved/shared tracks. The thing about the gamepad is the fact that it is a window to another world. What if it could show paralel universes happening in your room. Including past, future etc. I think would be cool to have a game where you can travel through these realities bringing something from one to another to solve puzzles and help every version of living beings in versions of your room to solve their problems. With this, would be possible to tell a lot of intersting storylines where the player is actually the protagonist. The Wii U would be turned in a Universal InteractiveInterrelation Window Machine and maybe, some of your best intentions could bring caos to some of the universes. I would make a game where the actions are saved and universes can react in unexpected ways. This way the player can't change choices unless he starts all over. The game would have a number of endings that would reflect the player's choices and I would like to see some hard emotional effects caused in the player. The mechanics could be something like a First-Person-Shenmue where you use motion controls to navigate the room and interact with it. The idea is that every room has a machine that is connect to your Wii U and your actions would be limited to what each machine can do. For example: Imagine you are connected to a TV in the 80's. This TV is on a musician's bedroom. This guy is trying to create a new hit but can't and he has to pay rent. Imagine that earlier you were on a camera in a rock show in the future, and you recorded one song. You could choose to show this clip in his TV. Work with Atlus (okay, Sega currently) or another developer (Ubisoft and Might & Magic X, or the next Legend of Grimrock Game from Almost Human Games), to put out a dungeon crawl or exploration game like Etrian Odyssey out on the WiiU, with the map-making, inventory & quest management, and leveling up being done through the WiiU touch screen (alternatively make the game entirely in-house). Something similar could be done if Skyrim were to be ported to the WiiU. A new IP set in Feudal Kyoto linked with Nintendo or an earlier Nintendo like card company. Something like Sakura Samurai meets Goemon, a full blown action adventure game. 10 votes for a business sim about Nintendo in the 1800s! For example, the year is 1889: the year that Nintendo was founded. You play as Fusajiro Yamauchi, the person who founded Nintendo, starting the company during the middle of the Meiji period (the same historical timeframe that Rurouni Kenshin takes place in). This fictionalized business sim embellishes the story of Nintendo's founding during the transition period from feudal Japan to modern Japan. Could focus just on the start of Nintendo, or go further in time as you manage Nintendo (or the fictional Nontendo mentioned in Rusty's Real-Deal Baseball) from being just a Hanafuda card maker to a toy company that creates the Ultra Machine, the Ultra Hand, and more. The most popular idea for a new game was this: 93 votes for a "Dungeons and Dragons-style with DM controls on the gamepad!"... along with 163 votes for "a more traditional tabletop RPG style game where the Dungeon Master uses the GamePad to control, build, and utilize the dungeon while the other players play through it." So many ideas for which games you should make for Wii U.
I'll be the first to admit to loving franchises. The problem is, no new franchise title as of late has peaked my interest as in years' past. Remember when we thought we knew Mario, and then Super Smash Bros. was announced? Remember when we thought we knew Link, and then Ocarina of Time came out? Remember when we thought we saw all Pokemon would ever be, and then Pokemon Snap took us on safari? Titles like these broke the mold and reshaped our ideas of what each franchise was capable of becoming. Likewise, let's think back even further, to a time before Mario, Link, Fox, Kirby, Samus, and Pikachu even existed. Dark days, indeed. Each brilliant success of Nintendo has come from taking chances on ideas that stemmed from fighting the status quo. The idea that a plumber navigating pipes to save a princess from an evil turtle while riding on the back of a friendly dinosaur and eating psychedelic mushrooms along the way would be a hit was crazy, but Miyamoto made it all make sense. 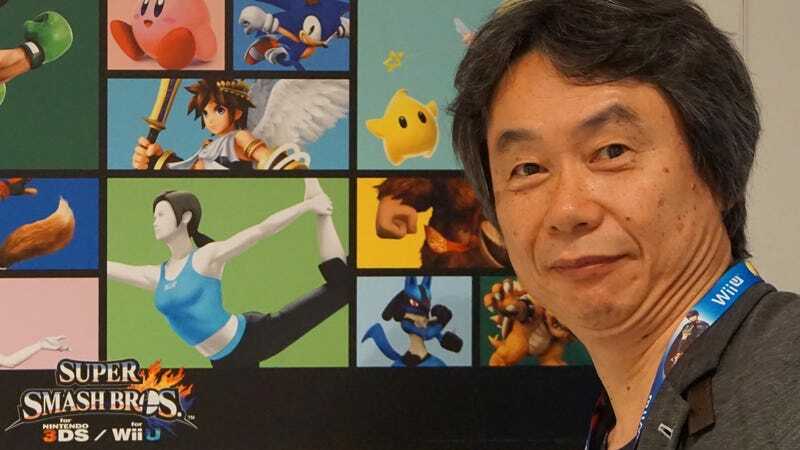 The thought that a fairy boy who talked to trees and used a magic ocarina to travel back and forth through time to save the world would be a hit was crazy, but Miyamoto made it all make sense. That all the main characters from those games and others could come together and beat up on each other in a sumo-wrestling style game that was violent but strangely not violent and then go on to be a cult classic was crazy, but once again, Miyamoto showed us the way. These approaches broke molds and turned the gaming world upside down. Simply revisiting a title with a number after it is far less likely to achieve the same level of impact. Just look at what happened with Call of Duty. If money is all you're after, sure, keep churning out sequels. They're good for that. But when was the last time any of us played a sequel that left us speechless and reconsidering ourselves? Wii U needs a groundbreaker. Maybe it's time for Miyamoto to once again stop listening to what people say they want. Maybe it's time for him to once again start something completely new. Maybe it's time for him to once again show us the way. There you go. I hope that helps. Also, thank you to reader OtakuMan24 for helping me track all the nominations and thank you to all of the readers who made their voices known.